One of our favourite itineraries - walk the Laurie Lee trail, followed by lunch at The Woolpack, and then pay one’s respects at Lee’s simple gravestone in the church bang opposite the pub. 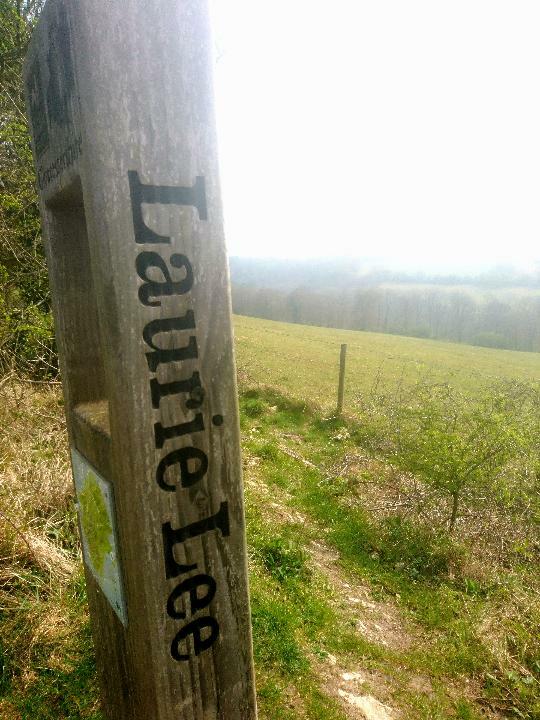 The Laurie Lee Wildlife Way is a 5 mile walk through the achingly beautiful Slad Valley, up some heart-pumpingly steep slopes, down some knee-testing descents, over grasslands and through woods - the best of England. Lee’s poetry makes its appearance on 10 posts along the way, so by the time The Woolpack comes into view 2 - 3 hours later, one is invigorated mentally as well as physically and in need of a pint (sometimes there’s Bushel+Peck cider or perry available). The Woolpack itself is, in some ways, a perfect pub. First and foremost, it retains that key element which all pubs should have - it still feels like a place in which to drink and in which locals do drink. But it also does what pubs now need to do in order to survive and that is provide great food for people passing through. The Woolpack manages to do both brilliantly. And when the sun shines and it’s crowded there’s a terrace on which to relax, overlooking the valley. Suggest you visit - it’s GL7 6QA if you use SatNav rather than an old fashioned map and if you use an old fashioned map the Slad Valley is north of Stroud, Gloucestershire. So there you have it. And thank you if you’ve read this far. La Méthode Champenoise didn’t originate in the Champagne region of France. It comes from Gloucestershire. Obviously. In the early 17th century, the fuel used to make glass was wood but excessive destruction of woodland led James I to issue a proclamation in 1615 prohibiting its use in glassworks. As a result, experiments using coal began in earnest. Initially, the resulting glass was very dark, almost black, as a result of the sulphur content of coal - not ideal for windows but not such a problem for bottles. The process was improved, including the use of chimneys to improve the draught, which removed the sulphurous fumes more quickly. Where the experiments were successful, the higher temperatures achieved using coal produced stronger bottles made from this thick, dark glass. In 1632, Sir Kenelm Digby was awarded a patent, when it was accepted that the bottles were the result of a new process. Sir Kenelm did his experiments in London, but the process was implemented and fine-tuned in the glassworks in Newnham, Gloucestershire. The Civil War then intervened and disturbed things somewhat, including the destruction of the Newnham glassworks. However, every cloud has a silver lining. Up until then, cider was the drink of the cider-making counties … but not elsewhere. As a result of the war, troops and officers from elsewhere in the country came across cider as they marched up and down through cider-country - and, of course, it made an impact. After the war, the former soldiers wanted to maintain their newly acquired cider habit and so shipments of cider and perry to other parts of the country began in earnest. Generally, cider would be shipped in barrels but some was shipped in the new glass bottles and, being stronger, they didn’t explode. Also, it was noted that the quality of cider in glass bottles improved, a result of secondary fermentation and the product developing a softly sparkling quality. Glassworks in cider-country proliferated as more and more cider was shipped around the country in glass bottles; by the end of the century, 18 of 39 glassworks in England were located in cider-land (if one includes Stourbridge as being in cider-land). The glassmaking industry migrated from the Forest of Dean towards Bristol, a significant trading port, and “English glass bottles” were shipped from there to all over the world; North America, Europe … and the Champagne region of France. At the same time, cider-makers began to manage the secondary fermentation by adding a little sugar to the product before bottling and corking it. In 1662, all of this was noted by a founder member of The Royal Society, Dr. Christopher Merrett of Winchcombe, Gloucestershire (where we so happen to live). And so the process now referred to as the Méthode Champenoise was developed and recorded, made possible only by the new tougher glass (verre anglais) and the ingenuity of English cider- and perry-makers. Long before Dom Pérignon emerged from his Benedictine monastery in Hautvillers. But, to avoid any suspicion of unpleasant and over-exuberant patriotism in which we will play no part, let it be noted that the first record of sparkling wine predates the work of Sir Kenelm Digby and Dr. Christopher Merrett by 100 years; Blanquette de Limoux was developed by Benedictine monks in the Abbaye de Saint Hilaire, near Carcassonne, in 1531. So, there you have it. And if you’ve read this far, thank you. Acknowledgement to Jim Chapman of Hartpury Heritage Trust and Treasurer of the Gloucestershire Orchard Trust. For the full and complete story, read Orchards… those other industries, by Jim Chapman, published by The Hartpury Heritage Trust, Gloucestershire, May 2016. There were, perhaps, 5 possible reasons we planted the perry pears in the way we did. It could have been randomly. It wasn’t. It could have been done in alphabetical order. It wasn’t (obviously). It could have been done, as our lone entrant suggested, in the order in which blossom appears on each tree, to assist with pollination. This is a very sensible way in which to plant fruit trees, particularly in a domestic setting or in a small orchard and several of the orchards we’ve planted have been arranged in this pattern, for a very good reason. Most apples and pears are not self-fertile (and those that are grow more fruit where cross-pollination can take place) and the vast majority of apples and pears are self-sterile - they cannot pollinate themselves. They therefore need to be pollinated by another tree of the same Genus (apple pollinating apple, pear pollinating pear) but of a different Variety … a Court Pendu Plat apple will not pollinate another Court Pendu Plat apple (we are forever delighted by the names of apples). And to improve the chance of pollination it’s advantageous to plant trees that will be in blossom at the same time close together, so the bees and hoverflies can easily hop from the flowers of one tree to the flowers of the next. For this reason, fruit trees are classed into 5 categories, A to E (imaginatively), with those in Group A flowering earliest and those in Group E flowering latest. So, plant trees in Group A close to other Group A or Group B trees, but not trees in Groups C, D or E as these won’t be in flower at the same time. It could have been done in the order of pollination … but it wasn’t. It was planted in the order in which the fruit ripens. The orchard is on a working farm and the pears are harvested to make perry. The fruit that ripens earliest has been planted closest to the farm, so that it can be harvested and taken to the barn for milling and pressing with no danger of damaging or disturbing later fruiting varieties; the route to later fruiting varieties will then be past trees that have already been harvested. This planting pattern also minimises damage to the land caused by tractors and trailers (apparently). But why does the pollination pattern not matter in such an orchard? Well, in large orchards such as this there are generally plenty of trees of all pollination groups dotted around, so it doesn’t matter as much as it would in a garden with just 2 or 3 trees, where getting the pollination groups right is essential.